If you'd wake me up in the middle of the night and ask me about my favourite mountains, Cerro Torre would probably be one of the first I came up with. Ever since I first saw a picture of it, and even more so after my first visit to Patagonia, I have been deeply fascinated by the peak and its mysterious history. Interestingly though, despite it being one of my favourite mountains, I don't think Cerro Torre's beauty and grandeur easily translate into landscape photographs. I am not saying that you can't get away with a striking shot of the peak - I have done that in the past and so have many others before and after me. What I'm trying to say is that it's hard to capture the real essence and magic of the mountain, the sensation you feel standing in front of it. Although you can reach the lake beneath Cerro Torre with little effort, you will still find yourself nine kilometers away from its peak. While this is easily close enough for your eyes and mind, the distance also defines the lowest angle for photography. In wide-angle shots the mountain is dwarfed by the surrounding ridges and while you can shoot frame-filling close-ups with a short tele, you will end up telling merely half the story. Of course there's only so much you can do about this, and unless you're into serious mountaineering, bring ice climbing gear and a permit your choice of (low) angles and thus dramatic compositions will stay limited. But it's not only a question of the viewpoint. Sunsets render Cerro Torre as a silhouette (albeit one of the distinctive kind) and sunrise light (at least in summer) hits the mountain straight on without dropping too many shadows. Of course we are talking about Patagonia and you can be lucky with unique weather conditions, but then again chances are that light and clouds will even more so divert from Cerro Torre itself. The shot above is my latest attempt at capturing Cerro Torre's majesty. Of course it cannot overcome the restriction mentioned above, but I'm still quite happy with this contrasty, moonlit rendition of the peak. Bright, fast moving clouds create a beautiful backdrop for Cerro Torre both making its silhouette stand out and telling the story of the ever blowing patagonian wind. 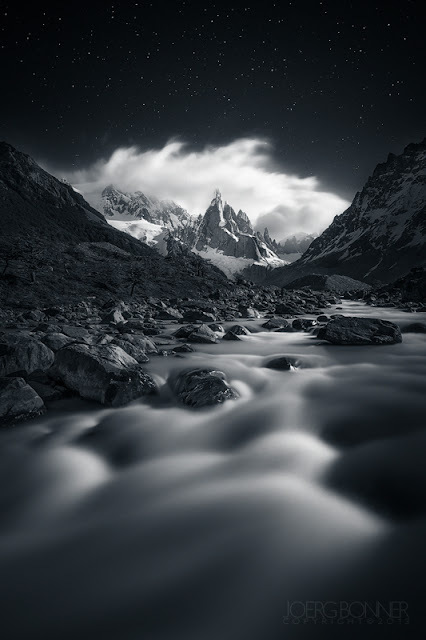 The rapids of the river, looking soft from the long exposure, provide a nice leading line without distracting from the peak, whose ridges are nicely pronounced by the moonlight hitting the granite and ice. Like a vignette, the scene is framed by the dark river, dark ridges and a dark night-sky speckled with sparkling stars. Two exposures processed in LR, blended in PS, then reimported into LR and converted to monochrome with a hint of split toning going for cooler shadows. it comes as no surprise to me that you're the first to comment again. thanks for your continuous support, amigo! un abrazo! One of the best I've seen of this glorious, iconic mountain. Despite I've not been in Patagonia, I have the same conclusion than you: it's not easy to have "the perfect" frame on Cerro Torre (and even in Cuernos del Paine I'd say). The your is one of the bests I've seen from this area. thank you for actually reading - i wasn't sure if anybody would understand what i was trying to say! and you're right - it's kinda the same thing with the cuernos del paine and maybe even more so the torres del paine (here you can at least get close and low).